The WUDC is governed by the World Universities Debating Council, a representative body in which each nation attending Worlds is able to participate. The Council is led by an Executive Committee and distributes proportional voting authority based on historic participation of nations in the competition. The Council meets annually on New Year’s Day. The World Universities Debating Council is comprised of the elected or appointed representatives of member countries. These representatives also select non-voting regional representatives. The current regions recognized by Council are Africa, Asia, Europe & the Middle East, Islands of the North Atlantic, Latin America & The Caribbean, North America, and Oceania. At the end of each Council meeting on New Year's Day, Council elects an Executive Committee consisting of a Chair, a Secretary, a Registrar, and an Equity Officer. Together with the Women's Officer (chosen in a separate election at the women's forum), and two representatives of the Organizing Committee for the next WUDC round, these officers serve as Council's executive body for the year following the meeting. The below diagram outlines this structure. The Council has taken various forms over its now more than three-decade history. Initially an ad hoc organization closely linked to the organizing committee of the present round of the Championship, it has evolved into an independent, representative body with broad powers. Its prerogative today comprises the ability to reform the rules and structure of the competition, to enact initiatives to achieve goals like regional and gender diversity, and to select and audit hosts for the WUDC. A large number of other national and international debate organizations, from domestic leagues to intracontinental championships, are affiliated with the World Universities Debate Council. 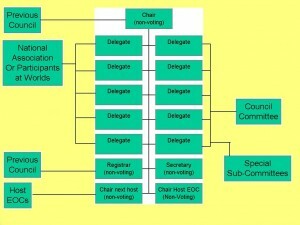 But beyond the role these organizations sometimes play in the selection of national or regional delegates to council, these organizations are exclusively affiliates. Governance of the WUDC remains exclusively the domain of the Council.